About a year ago, Joel Smilow went to Oscar’s for lunch. A longtime Westporter, and the former chairman and CEO of Playtex, he’s also a noted philanthropist. He made a transformative gift to Yale-New Haven Hospital’s Smilow Cancer Hospital, and donated medical research buildings at NYU and the University of Pennsylvania (among many other endowments). 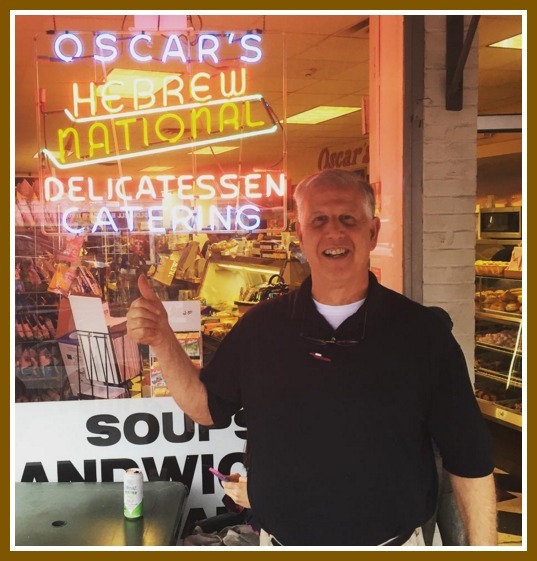 Lee Papageorge — the popular owner of Oscar’s Delicatessen — was struck by a sudden thought. Lee was happy to do so. Two months ago, Lee received a tough diagnosis: lung cancer. It was particularly devastating because he never smoked — not once in his life. Lee is now undergoing immunotherapy — at the Smilow Cancer Hospital. Lee — who is 65 — has been a part of Oscar’s since the actual Oscar hired him at 16. Working in the original store — a few doors down Main Street, now part of Vince Clothing — Lee earned $1 an hour. “I had $20 in my wallet. I felt fat!” he says. In 1967, Joe Milici bought Oscar’s (from Oscar). Lee kept working there. Four years later, he became a 50% partner. They moved to their present location soon thereafter. The ’70s and ’80s were exciting times on Main Street, Lee recalls. There was always something going on. He and store owners like Bob Hertzel, Stan Klein, Drew Friedman and Dan Coughlin were prime movers behind the Westport Downtown Merchants Association. They loved the area, the town and their customers. They supported each other, too. 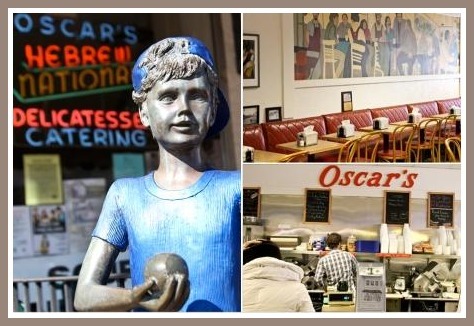 Now, Oscar’s is the oldest — and last — “mom-and-pop” store on Main Street. As he battles cancer, Lee has been buoyed by the support of “very strong women.” Susan Gold, of the Westport Historical Society, has been particularly helpful. Since he was 16, Lee has been a part of Oscar’s. And Oscar’s has been a part of downtown. Lee’s many customers — and friends — send all their best wishes to him. This entry was posted in Downtown, Organizations, Restaurants and tagged Lee Papageorge, Oscar's Delicatessen, Westport Downtown Merchants Association. Bookmark the permalink. I never eat anywhere else when in town. Prayers up for you Lee. During the late 1970s, on Sunday mornings, my brothers and I, who resided across from the Longshore pillar entrance, would divert our parents station wagon enroute to St. Luke’s catholic church, and play hooky from church, or, at other times, stay at church for a few minutes and skip out moments before a sermon. Our first diversion from church was, consistently, Oscar’s Deli, usually to nosh on coffee or a natural soda (very unique at that time), plus a fresh-toasted bagel with cream cheese (consistently fresh) or an egg sandwich, often consumed while parked in the car on a quiet Sunday hours time span, right on Main Street, often because the seats inside might have been packed with patrons. The diversion from church to Oscar’s occurred enough times over the course of a few years that we began to refer to it as Saint Oscar’s. Whenever I return to Westport, a visit to break bread at Oscar’s is a must do on a Sunday or any other day of the week. Sorry about the cancer. I pray the vital traditions of the store can endure somehow. Sending good thoughts to Lee,Dan. I am not sure where to start. Lee is my friend. His diagnosis makes me sad to my core. He is someone who, when I found out I had diabetes 12 years ago, helped guide me thru the fears and questions that came from our illness and has always been the their for me and my family. But to be Lee’s friend is just to touch the surface of the world of Lee. Like a giant iceberg floating in the sea, Lee has a tremendous amount below the surface that is not for the publics eye. The biggest part of that “ice” foundation is his family. The love they have for him and the people HE loves is beyond impressive. They have and will always be their for Lee. I am blessed to call them my friends as well and while I know he would prefer they did not have to deal with what he is going thru, their is no place else they would ever be then by his side. But the ice goes even deeper then that. Over the 40+ years Lee has welcomed most Westporters (and all its visitors) into Ocsar’s he has become somewhat of an icon. A beacon of entrepreneurial success and hard work. Lee continues to be an advocate for those with special needs and over the years has employed many at Oscars. Lee is not a flashy man. He is humble and proud. He has a kind and generous heart. You can’t help but want to sit with him and hear his stories (and boy does he have stories). He can always be found in his antique barber chair (when I don’t kick him out) greeting customers, making jokes and making sure everything is running the way he needs to. But again, the ice below the surface continues. Lee, as DAN pointed out, has been a strong advocate for the beauty and health of downtown. He continues to care about the town he has worked in for so long and like so many, cautiously embraces the changes coming, all the while putting his personal imprint on it. So, while Lee’s diagnosis is scary and as far as I am concerned undeserving, the support he is getting is not surprising. We do live in a world where medical advances provide hope. I for one will continue to HOPE for the best because I want to see that iceberg floating above rue surface for many more years. Lee is my friend and I love him. I pray for him and I pray for his family. It goes without saying that Oscar’s is a Westport institution on Main St., and Westport owes much to Lee Papageorge for his long-standing passion for a vibrant downtown and for maintaining Oscar’s as, well, Oscar’s over the years and through Main Street’s evolution(s). Heartfelt prayers and supportive thoughts for Lee as he battles this disease. Just one example of how community-minded Lee is: every year on the Sunday afternoon of the Academy Awards, he lets the Westport Cinema Initiative stage an Oscars party in his deli. And last year or the year before, the event fell on his birthday and he was still there helping run things. Oscars party at Oscar’s — get it?! We moved to town in 1973 and one of the first places we started going to for a breakfast or family lunch was Oscar’s! Lee hasn’t changed in the forty two plus years we’ve been going there- friendly, funny, whimsical (barber chair, wall mural, napkin holder sayings, statuary out front), good hearted ( jobs for- special – special needs people) and loyal(same crew for years and years)! Wishing you the best, Lee. Thanks for paying it forward and giving me my first job at 15, at my favorite eatery in town – Oscar’s. So sorry to hear the news. Lee is a great man and has always been very generous. All my best to him and his family. Lee you are in my prayers. You are a wonderful man and a great boss. I am so glad I had the chance to know You. Wish I knew you 20 Yrs ago. Prayers going your way to you and your family. Lee you have been part of the fabric of our town for 50 years. You have always been generous with your time and resources. Plus, there is nothing better than sitting outside Oscar’s on a beautiful, leisurely sunny morning with a cup of coffee watching the world go by. Lee you are one of the good guys and I wish you well. I am so sorry to hear of your diagnosis. Since my start at Christ & Holy Trinity, you were always a tremendous supporter of, and generous contributor to, community events we welcomed there. It was such a delight to see your smile and warm outreach to all. I miss seeing you so often since leaving Westport, but know I wish you the best from my deepest heart. Lee my thoughts and prayers are with you! This must not beat you. You are too important to this whole town! Manny Margolis beat lung cancer with good doctors, a positive attitude and great sense of humor. He never smoked either. Now it is time for all of us to “wait on you.” Please let us know what you need and when you need it. Oscars is and always has been our go to. From the 70’s when my mom took me in after a movie to now when I bring my own in, Lee is always there. He is a great friend and human who is always willing to help out others and the town. He is know to all and all love him. Wishing you a speedy recovery Mr. Lee and many more great years on Main Street.